The words below from Wendell Berry inspire me. Wendell is the author of The Unsettling of America and many other books, and a guru of local food, ethical farming, and community. This passage was printed in the bulletin of a Charlotte church as part of their Earth Day celebration. A group of about 10 from the church flew out to Kentucky last month and met with Wendell for a couple of hours in his home, to hear his thoughts on environmental activism and local food. I wasn't in the group, but a couple of my friends were and they told me about the conversation. 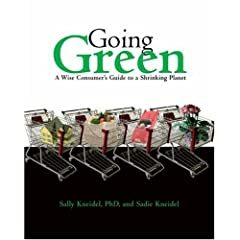 Wendell observed that environmental activism might be best practiced as a half-time job, to keep some sense of balance and well-being. He advised the visitors to spend some time every day doing something that brings "glee." To him, that might mean watching a nesting bird feed its young, or lying in the grass beside a pond enjoying the sights and sounds of the pond wildlife. Beware the justice of Nature. Learn, therefore, to prefer small-scale elegance and generosity to large-scale greed, crudity, and glamour. Make a home. Help to make a community. Be loyal to what you have made. Put the interest of the community first. Love your neighbors - not the neighbors you pick out, but the ones you have. As far as you are able make your lives dependent upon your local place, neighborhood, and household - which thrive by care and generosity - and independent of the inudstrial economy, which thrives by damage. Find work, if you can, that does no damage. Enjoy your work. Work well." Wendell Berry, "The Futility of Global Thinking"
Not too long ago, scientists used to believe that "tool use" was one of the characteristics that set humans apart from all other animals. We now know that animals do use tools. The list of species observed not only using tools, but making tools, continues to grow. Chimpanzees were the first species observed with tools - Jane Goodall saw chimps using sticks to extract edible termites from underground tunnels. More recently, chimps have been observed making and using spears on other prey. Bird species also make tools to forage. A warbler species on the Galapagos uses thorns to probe under bark, and scrub jays make and use hooks to retrieve edible items - to name a couple of examples. Marine biologists have also documented bottlenose dolphins using tools. Scientists say that dolphins in Australia's Shark Bay wear marine sponges on their beaks like a glove, to protect their sensitive beaks when foraging along rugged ocean bottoms. Poking around in deep water carries the risk of stings from bottom dwellers. 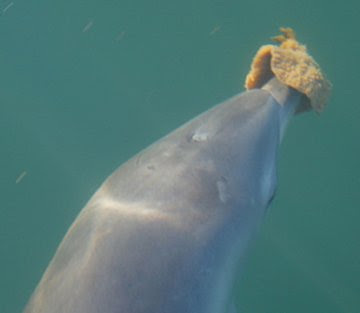 The boater who first saw a sponge on a dolphin thought it was a tumor. But the tumor turned out to be a sponge. As marine biologists have studied the tool use, they've discovered something even more interesting. Only the dolphins in the Shark Bay location use the sponges, and only a fraction of the dolphins in that bay use them. The scientists have studied the family relationships of the dolphins in the bay and have now determined that the spongers belong almost exclusively to a single maternal lineage. The sponge behavior is being transmitted from mothers to offspring. But... the sponging doesn't follow any of the patterns that would be expected if it were genetically based. The scientists have concluded that the spongers are learning the behavior from their mothers - the only interpretation that fits the observed family relationships of the spongers. Whether the spongers are learning from observing their mothers, or are being intentionally instructed by their mother remains to be seen. This is not the first example of what is known as "cultural transmission" of behaviors in animals - behaviors transmitted to other individuals by way of observation or instruction. At least one population of macaque monkeys regularly wash their grains in pools of water, and that behavior is known to be culturally transmitted, for these particular monkeys. What more will we learn in future years about the traits we share with our animal relatives? These discoveries are, for me, all the more reason to do whatever we can to stop the environmental degradation that threatens wildlife species worldwide. See my previous post for three things you can do to slow habitat loss from global warming. The Earth's most serious and menacing problem is global warming, a problem that will grow in coming decades. Global warming is due to the accumulation of greenhouse gases, and the United States creates more of these gases by far than any other nation. So here are 3 big things you can do to reduce our production of greenhouse gases. 1) Reduce fossil-fuel use with your travel. Specifically, drive a car that gets good gas mileage, or use public transportation or a bicycle, or car pool. 2) Change all the light bulbs in your house to compact fluorescent bulbs, which use about 10% of the electricity of an incandescent bulb and last for several years. Using less electricity means making less demand on coal-fired power plants, which are one of our biggest sources of greenhouse gas emissions and other air pollution. These bulbs are available at Home Depot. They cost more than regular bulbs, but the longevity of the bulbs makes them less expensive in the long run. We changed all of our bulbs and it made about a 30% difference in our utility bill! For more information about this, watch the movie "Kilowatt Ours" by Jeff Barrie. 3) Eat fewer animal products. According to a recent report from the U.N. ("Livestock's Long Shadow"), the livestock sector is one of the top 2 or 3 biggest sources of greenhouse gases. And Americans eat way more meat than any other nation, per capita - a whopping 248 pounds per year per person, compared to only 176 pounds per year per person in other industrialized nations, and only 66 pounds per person per year in developing nations (from a Worldwatch Institute document available online, "Happier Meals" by Danielle Nierenburg). The U.N. document "Livestock's Long Shadow" is available online - just google the title. Our Republican senator, Elizabeth Dole, announced yesterday that she too will take a stand to protect wildlife. She joins thousands of activists who have banded together to protect crucial wildlife habitat on the coastal plain of North Carolina. Citizens and politicians from all over the state have united over this struggle, including farmers, hunters, birders, environmentalists.....even the NRA! The Navy wants to build a landing field near the Pocosin Lakes National Wildlife Refuge, right smack in the middle of a vital migratory flyway. Every year, hundreds of thousands of waterfowl overwinter in the refuge before heading to their spring breeding grounds in Canada and in the U.S. prairie states. These birds include tens of thousands of Tundra Swans, Snow Geese, and many duck species such as Green-winged Teal and Canvasbacks. The Navy has acknowledged that the hundreds of thousands of birds may endanger pilots, but has suggested relocating birds or even poisoning them. What? Are they insane? We are blessed to still have this refuge more or less intact, given that the pork and poultry industries have all but taken over NC's coastal plain entirely with polluting factory farms (think "Smithfield" and "Tyson"). NC has more hogs than people, sadly, and their waste lagoons are fouling the air and water of our state. But, anyway, I digress. I am thrilled that momentum is with us to stop this landing field. When we all turn out - it sometimes it seems to have an effect. Past civilizations have fallen when they wore out their supply of soil, and in his new book "Dirt: The Erosion of Civilizations,"University of Washington scientist David R. Montgomery says the same thing appears to be happening again -- with potentially far more serious consequences. Throughout history civilizations expanded as they sought new soil to feed their populations, then ultimately fell as they wore out or lost the dirt they depended upon. When that happened, people moved on to fertile new ground and formed new civilizations. That process is being repeating today the geomorphologist argues and the results could be far more disastrous for humans because there are very few places left with fertile soil to feed large populations, and farming practices still trigger large losses of rich dirt. "We're doing the same things today that past societies have done, and at the same rate," said David Montgomery, a UW professor of Earth and space sciences who studies the evolution and structure of the various aspects of the Earth's surface. In essence, he said, we are slowly removing our planet's life-giving skin. 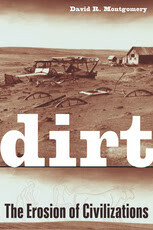 "It only takes one good rainstorm when the soil is bare to lose a century's worth of dirt." Montgomery examines how soil is slowly created over time, the vital role it has played in the rise and fall of civilizations from Mesopotamia to Rome and the way it has shaped where and how we live today. In the past, as soil was depleted in a particular region – the American South during the height of tobacco plantations, for example, or the Great Plains during the Dust Bowl of the 1930s – people moved to new areas that could support their crops. 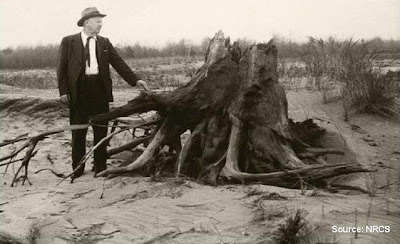 But Montgomery argues that their primary farming method – plowing under any crop residue and leaving the surface exposed to wind and water erosion for long periods – was a major cause of the conditions that drove them from the land. Flat lands and areas with thicker, richer soil tend to have less natural erosion, while steeper areas have greater erosion from both wind and water. Removing vegetative cover just worsens the problem, Montgomery said. When the Earth's population was smaller people could move from one place to another and give soil a chance to regenerate. But now, with more than 6 billion people on the planet, that option no longer exists, Montgomery said. "We're farming about as much land as we can on a sustainable basis, but the world's population is still growing," he said. "We have to learn to farm without losing the soil." He advocates a wholesale change in farming practices, moving to no-till agriculture, which he says would reduce erosion closer to its natural rate. That method would eliminate plowing and instead crop stubble would remain in the field, to be mixed with the very top layer of the soil using a method called disking. Farmers might need more herbicides to control weeds, but it would take fewer passes of farm machinery – and thus less fuel – to tend crops. Currently about 5 percent of the world's farmers engage in no-till agriculture, the vast majority of them in the United States and Latin America, Montgomery said. "We don't have to farm the way we do. It's as much a matter of culture and habit as it is of economics, and our habitual ways of farming have gotten people into a lot of trouble through the years," Montgomery said. "It's more of a conceptual shift than anything else, but it's a conceptual shift that conserves the soil." Unless we stop them, the US Navy will build a jet landing field right beside North Carolina’s famed Pocasin Lakes National Wildlife Refuge. Birds will have to be killed. And pilots will be in danger. Come to a public hearing and tell the Navy what you think about their proposal. Many other sites for the landing field are available with far less impact on critical wildlife habitat. to let your voice be heard!! The United States Navy proposes to place an outlying landing field (OLF) in Washington and Beaufort Counties, NC, farming communities in the northeastern part of the state. The purpose of the landing field is to allow pilots to practice jet aircraft carrier landings. The OLF would see thousands of such landings throughout the year, about one every fifteen minutes by the Navy’s estimate. The Navy plans to acquire 30,000 acres around the airfield. Approximately 1,700 acres of the core area are considered prime farmlands. The area is less than four miles of a major migratory stop for hundreds of thousands of tundra swans and snow geese. These are big birds. 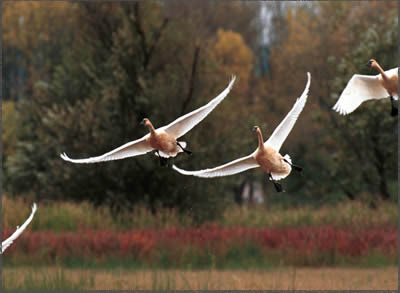 Tundra swans weigh 10 to 20 pounds, have a wingspan of 5 to 6 feet and fly at night as well as during the day. The 10 squadrons of Super Hornet fighter jets that would use the OLF would be based primarily in Virginia. Only two squadrons would be based at Cherry Point in Carteret County. The communities where the planes are based receive the economic benefit associated with a defense installation, in terms of good jobs and increased tax revenue. There is no net economic benefit to hosting the OLF. The OLF would be located just 3.5 miles from the Pocosin Lakes National Wildlife Refuge, one of the most important waterfowl reserves in North America, where more than 100,000 snow geese and tundra swans spend the winter. Northeastern North Carolina provides winter refuge for 65 to 75 percent of the birds that migrate along the Eastern flyway. The acreage the Navy plans to acquire surrounding the landing field provide critical food resources to swans, geese and other waterfowl. Pocosin Lakes also includes populations of black bears and endangered red wolves. The Navy plans to control the bird population include using dogs, fireworks – and poison. The North Carolina Wildlife Resources Commission has expressed grave concerns about the Navy’s proposal to use a highly toxic pesticide, Avitrol, which is banned for such uses in North Carolina. The Navy also acknowledges it may use firearms to shoot large migratory birds. Dale Hall, director of the US Fish and Wildlife Service, stated in a February public hearing that “We have a national wildlife refuge whose purpose is to pull birds in. The mission of the outlying landing field would be to push birds away”. Experts hired by the Navy have called this the “most dangerous location on the East Coast for a landing field.” The birds fly irregularly, with many flying from feeding grounds to sleeping areas at dusk and dawn. The Navy’s own bird-strike experts have stated that a plane crash due to a bird strike is inevitable at this site. Gov. Mike Easley and his administration have made repeated attempts to work with the Navy to choose a more suitable site. In a statement in February of 2007, Gov. Easley called on Congress to withhold funding for the OLF project until the Navy considers suitable alternatives. Local communities and over 100 diverse groups (ranging from Sierra Club and Audubon Society to Ducks Unlimited, the National Rifle Association and the NAACP) have all joined in the fight to get the Navy to choose a more suitable North Carolina site. Write or Call your Senator! Ask North Carolina Senators Dole and Burr to join Governor Easley in calling on Congress to withhold funds for the OLF project until the Navy is willing to work with the state on reasonable alternatives. Submit a comment to the Navy! Click Here to go the Navy OLF Supplemental Environmental Impact Statement Project site where you can send a comment via online form or US Mail. We can turn it around, though. This is one issue that we really can stop, if we speak up - because there is no major industry that stands to gain from allowing the landing field. No lobbyists, no campaign contributors. The usual corporate tools of influence that have their way with most politicians are absent from this scenario. So speak up!! Now's your chance! Sources: Much of this post was quoted from www.nc.sierraclub.org. Some came from www.fws.gov/pocosinlakes. The half-baked parts are my own. Wolfgang Puck. Photo courtesy of www.bfeedme.com. World-renowned chef Wolfgang Puck of Los Angeles has announced that he will use eggs and meat only from animals raised under strict humane standards. Humane standards generally mean more earth-friendly methods as well, because humane farms must raise fewer animals to avoid the crowding associated with inhumane factory farms. Fewer animals mean less waste, which is one of the most polluting aspects of factory farming. Humane farming means fewer hormones and antibiotics flowing into our surface waters too. Chef Puck joins a small but growing group of famous celebrated chefs around the U.S. who refuse to use foie gras, the fattened liver of force-fed ducks and geese. (See my earlier post of August 26 2006, Just What is Foie Gras?? Too Fat to Waddle.) His ban on foie gras is just the beginning. He has also adopted more humane criteria for his eggs, meat and seafood. Puck has 3 companies that fed more than 10 million people in 2006. Now, his companies can buy eggs only from hens that are not crowded into small cages, as is the industry standard. We visited an egg factory with more than a million hens while we were writing Veggie Revolution. We saw hens crammed into cages so small the birds don't have room to open their wings. The cages are stacked 4 deep so that the feces from each cage rains down on the ones below. 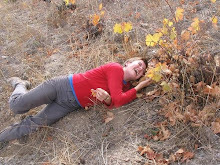 See my November 22, 2005 post on this blog, At Least Turkeys Don't Have to Lay Table Eggs for one of the pics from Veggie Rev. Working with the Humane Society, Puck has also directed his companies to buy veal and pork only from farms where animals are not confined to crates. (Sara Kate and I also toured a factory hog farm, and wrote about the sows we saw confined to crates so small they can't take a single step or even lie down normally. 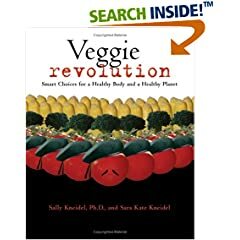 Veggie Revolution has pics and more detailed descriptions.) In the U.S., 80% of hogs are raised on factory farms that use these crates. Wolfgang Puck has considered seafood too. He vows to use only seafood whose harvest does not endanger the environment or deplete stocks. This is a difficult goal to achieve, unless he is harvesting very small numbers of fish and other sea life, caught with methods other than the long-lines, blast-fishing, and gill nets that have such a high "by-catch" (unintended mortality of untargeted animals). See my earlier post on this topic from September 4 2006, Puffins and Whales Endangered by Fishing Industry. Some smaller grocery chains such as Whole Foods buy meat and eggs only from producers who use certain humane standards. Whole Foods acquires meats from Niman Ranch, a company whose hog farming methods have been approved by the Animal Welfare Institute. AWI is in the process now of developing humane standards for beef production. McDonalds claims to have adopted more-humane standards for egg-laying hens. But they did so only under extreme pressure from PETA, and the improvement is only to cram 5 rather than 7 hens into the cages where egg-layers are housed for the duration of their lives. While 5 is better than 7, the living conditions for hens that lay for McDonalds is far short of "humane." 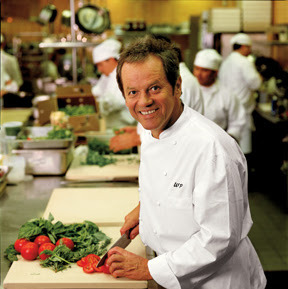 Wolfgang Puck is the best known celebrity chef to make a major public effort to support the humane farming effort. His enterprises include 14 fine-dining restaurants (such as Spago in L.A.) and more than 80 Gourmet Express restaurants. A well-known personality setting a precedent is extremely valuable to the movement, and will encourage and embolden others to follow suit. We hope. Ask your local grocer to carry humanely and sustainably produced animal products. Even if they don't do it, your request will have an impact, will signal growing public interest. If you eat animal products, support the humane producers by buying their products, even if they cost more. Kim Severson for NY Times. "Chef pushes animal welfare." Charlotte Observer, March 22, 2007. Sally Kneidel, PhD, and Sara Kate Kneidel. November 2005. Veggie Revolution: Smart Choices for a Healthy Body and a Healthy Planet. Fulcrum Publishing.